Did you see John Varvatos, one of the Mentors on Fashion Star wearing a jacket similar to this last week, and I see he is also wearing it on his bio? Can you ask for more than androgyny, a jacket that you can dress up or down, and can you get any more on trend than John Varvatos? 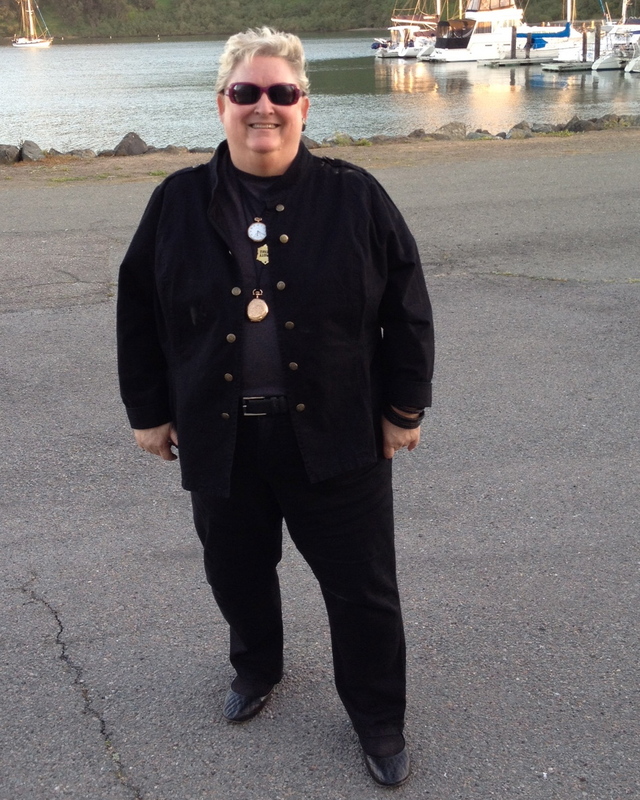 Yours Clothing, a plus size store in the U.K. was generous enough to send me this Military Jacket and the best thing about it, for me, is that their UK Size 30-32 fits my US size 26-28 body and I love a tailored look. The arms are a good fit for me as are the shoulders, so it is very comfortable and you know that is important to me. And it is 100% cotton, which means that in the cool San Francisco Bay area I will be able to wear it most evenings since the temperatures stay in the 60°s here. I have always been a pacifist so I think more of it as a “band jacket” but regardless, it is everywhere this season, and now it comes in our size. I thought you might also like to see my necklaces. The top and bottom ones are my husband’s grandfather’s watches (which I like to soften the military look and it keeps it in the right fashion era). 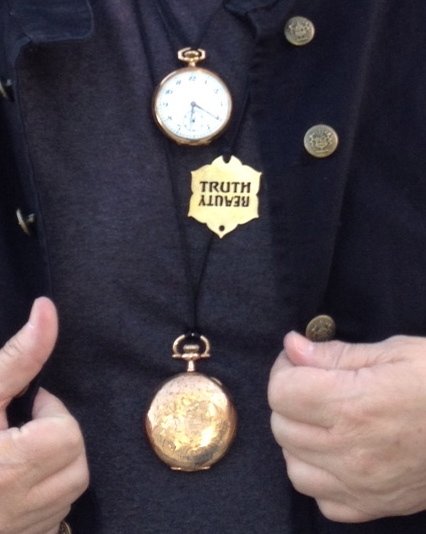 And the middle pendant is a brass logo of an art piece that is being made for Burning Man this year, Truth is Beauty. 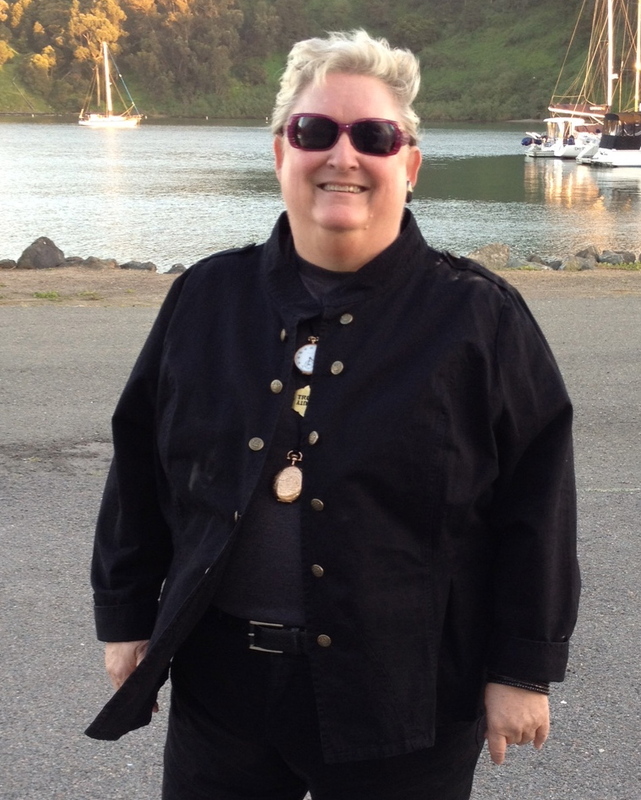 Here are the original photos of the jacket, just so you can see a little more detail. 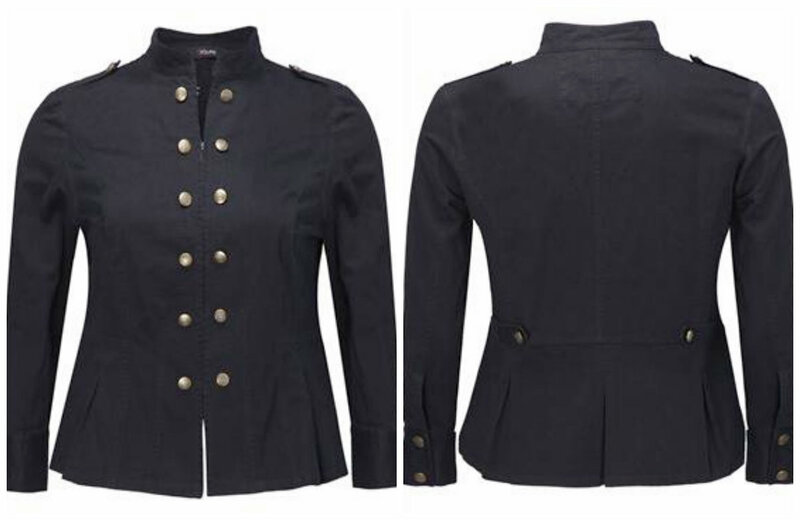 There are epaulets on the shoulders, with buttons and similar details in the back although it is dfficult to see in the photo. I showed up at a staff meeting yesterday (although I am a volunteer) at the Burning Man Project and there was my friend Jennifer Raiser (who is an amazing blogger and writer) and we each had on our matchie matchie outfits including a black bubble skirt, flats, and a patterned red blazer. It was so fun I just had to tell you about it. Dress: ASOS Curve – Size 22 U.S.
We Love Colors striped tights in both the black striped tights and the white striped tight are one plus size tights. I am a size 26-28, weigh 275 lbs., height 5’5″ and these tights just fit me and I love them. I have included the weight and height chart below. On the other hand We Love Colors has a solid color tight that runs up to 375 lbs., (and maybe even a little higher if you extrapolate from my weight in the prior chart). As most of you know I am an avid Burner (one who goes to Burning Man). I volunteer, I blog and most of my community stems from these amazing artists and people who make things and get things done. I volunteer because Burning Man and its culture and ethos have enriched my life. I don’t usually write about much that isn’t fashion related here, but this project in Haiti is a chance for me to give to a group of artists that need skills that are more practical so they can make a living. Please help if you can, even if only a little. Currently I am volunteering for Burners Without Borders and what I am asking is that if you also have found Burning Man to have enriched your life, or you would like to enrich another person’s life, that you consider helping Burners Without Borders in its partnership with Haiti’s Jakmel Ekspresyon Art Center, a unique community arts center for an important segment of Haiti’s artistic community. As the people of Haiti recover and rebuild from the 2010 earthquake, this center for creativity and self-expression is a vital part of its future. With the support of the Burning Man community, we can make a real and lasting difference in transforming this paradigm. This screen printing project will be the first of its kind in Haiti. 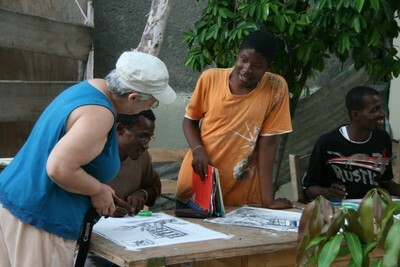 Burners Without Borders will send ten artists to Jacmel to teach skills in design, screen printing and professional development. There are currently no screen printing services available in Jacmel to create post-cards and t-shirts for the tourism industry or for the various international organizations who work there. This project is sure to be a success and we need your participation to make it happen. Please help Burners Without Borders and Jakmel Ekspresyon launch a new arts/artists-in-residence program that will benefit the local economy for the long term! Please spread the word. The theme at the festival on the desert I go to was Fertility 2.0 this year. My personal take on it is that because the event is spreading into the world they thought Fertility 2.0 was a good theme. 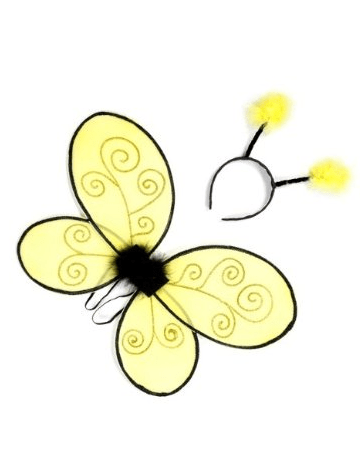 I do not usually pay much attention to the theme but I was asked to help with registration at a party and could we please dress as bees or flowers or some such thing. Well guess what, no one else showed up in a costume, but it is a party, right, so we put our smiles on our faces and had fun. 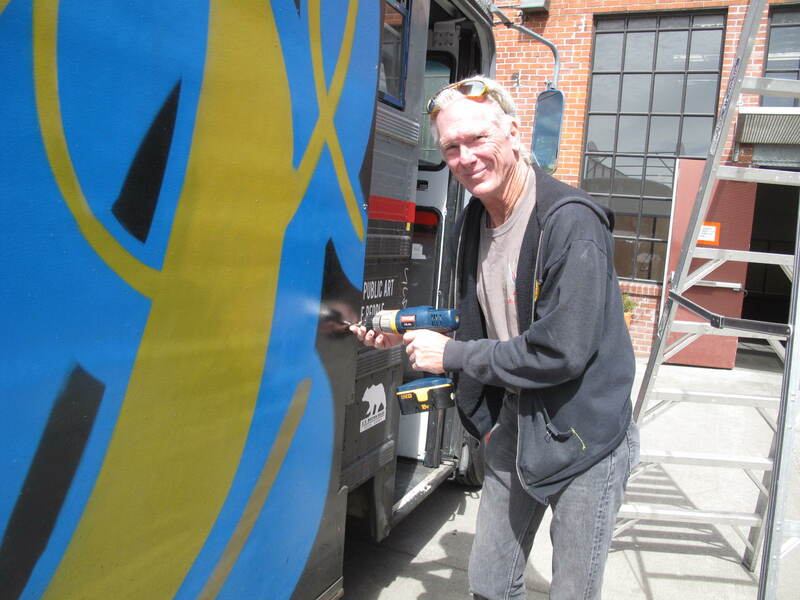 As most of you know I volunteer for the Burning Man Project, so yesterday my husband and I went to Oakland to help prep the ArtIsMobilUs, a school bus turned mobile art gallery. They removed the previous mural and put up new wood so a collaborative mural can be created on the first night of the Central Market Arts Festival, located at 6th Street and Market on Friday September 28. I took photos and as usual, he did the hard work. This t-shirt is so me. I love the theme of peace and change and I did not even realize it had little studs and rhinestones when I bought it on line. 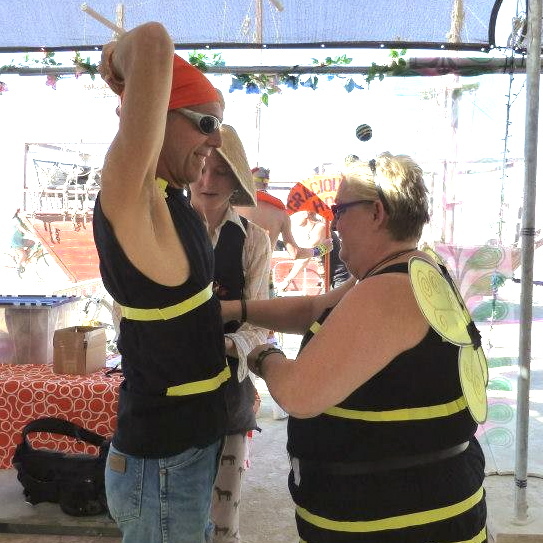 It was Friday at Burning Man and I was volunteering for the Burning Man Project. 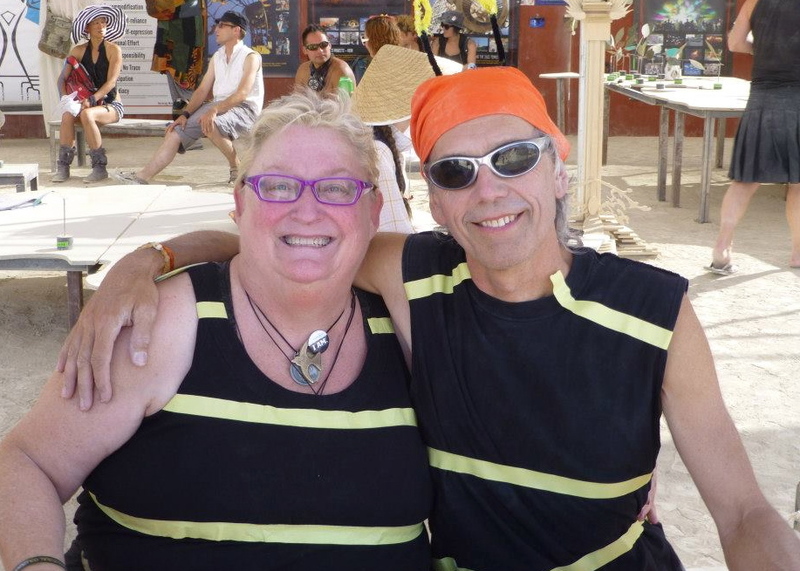 My job was to chat with people and find out how they were bringing the Burning Man ethos to their home town, or to just give them some time out of the sun. While I was there I ran into my friend Molly Vikart. She was with some friends waiting for an art tour. Molly told me that Jessica (see photo) created a mini that morning for their outing, so I wanted to share it with you. Since I am helping with various communications for the Burning Man Project, they suggested I go to a presentation at the David All Group (DAG). This was the first of a series of events that will take place synchronously between the DAG Washington, DC and San Francisco teams. I was live in the San Francisco office, which I loved. The event focused on “The Essentials of Twitter”. I have not tweeted much either for myself nor for any of the entities that I run social media for, so I had a lot to learn and as usual I most enjoyed learning about metrics or the suggested frequency and timing for the optimization of your tweets. Sometime yesterday (perhaps posted by the David All Group) I ran across this Twitter Outfit (below) from Social Media Inspired Outfits. So of course I had to put together my darker version of the Twitter Inspired Outfit, including the Twitter Bird logo (see the photo above with David All). My outfit is not exactly a match but I thought the Twitter Outfit was a little corporate for my taste. I am going to download DAG’s “Essentials of Pinterest” because I feel like I would love Pinterest but just have not taken the time to check it out, so you may see my version of that outfit too. So thanks to the David All Group for having me come to their offices. Hope to see you at Burning Man.